After journalist Jessica DuLong was laid off from her dot-com job, her life took an unexpected turn. A volunteer day aboard an antique fireboat, the John J. Harvey, led to a job in the engine room, where she found a taste of home she hadn't realized she was missing. Working with the boat's finely crafted machinery, on the waters of the storied Hudson, made her wonder what America is losing in our shift away from hands-on work. Her questions crystallized after she and her crew served at Ground Zero, where fireboats provided the only water available to fight blazes. 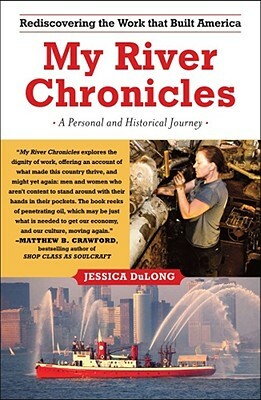 Vivid and immediate, My River Chronicles is a journey with an extraordinary guide--a mechanic's daughter and Stanford graduate who bridges blue-collar and white-collar worlds, turning a phrase as deftly as she does a wrench. As she searches for the meaning of work in America, DuLong shares her own experiences of learning to navigate a traditionally male world, masterfully interweaving unforgettable present-day characters and events with four centuries of Hudson River history. A celebration of craftsmanship, My River Chronicles is a deeply personal story of a unique woman's discovery of her own roots--and America's--that raises important questions about our nation's future.